This Course aims to enhance the techniques and knowledge of new entries and intermediate actuarial employees with 1-3 years of experience, specifically in the valuation and pricing. Through this solving based course, the Course Participants will gain hands-on skills in various techniques in setting up templates used to perform cash flows projections. Problems presented during this course are simulated from the real-life actuarial works of a life insurance company. Interested in this course? Please send an email to training@actbuilder.com.my and we shall notify you when the course is available! This Session covers the overall concepts of actuarial modeling, specifically cash flow projections (e.g. prospective/retrospective calculations, usage of recursive method & unit / grouped model point projection). 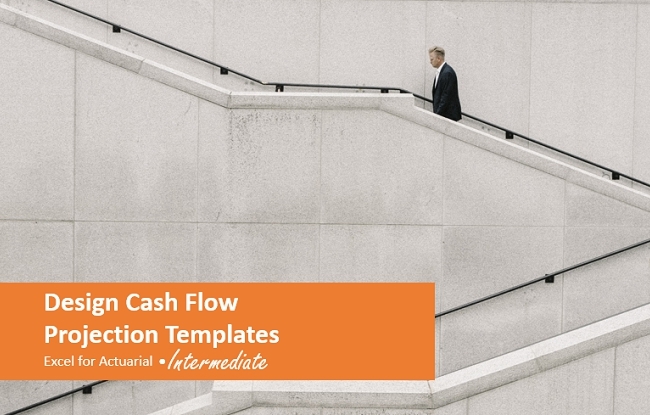 It also covers how a cash flow projection templates should be structured systematically – including recommendations on worksheet convention & formatting convention. A systematic template is crucial to efficiently manage an actuarial model that is used to perform actuarial studies, due to large volumes of calculations required (especially projections on monthly basis). This Session covers the characteristics of a model point used to perform cash flow projections, such as product profile, policy profile & insured profile. By using information available in the model point, the Course Participants learn to setup the “base” of cash flow projects, i.e. movement of policies. They also learn to setup basic variables for premium & claims (including reinsurance premium & recovery for products with reinsurance recovery) and observe the impacts under sensitivity scenarios (on movement of policies). This Session covers cash flow projections for other benefits (surrender benefit, maturity benefit & survival benefit), commission (Basic / overriding commission, production bonus & persistency bonus), expenses (general administration expense and agency related expense) and investment income. The Course Participants also learn to setup different sensitivity factors for the above-mentioned cash flow items for the purpose of sensitivity testing. By using the cash flow variables setup in Session 2 & 3, the Course Participants learn to setup variables for reserves and actuarial present values (“APV”, such as GPV or value of business “VoB”). They also learn to construct a projected revenue account (usually used for annual budget exercise) from the cash flow variables they have created in all Sessions. Notes: Each Session requires at least a half-day class to complete. Please note that no end-of-course project is included in this proposed course outlines due to limited number of half-day classes allocated to this training. The discussions and exercises under this Course use products from Conventional Life Insurance. The selection & complexity of sample products included in the Course (either participating, non-participating or investment-linked) are based on the Course Participants’ progress. Copyright © 2019 ACTBuilder Actuarial Solutions. All Rights Reserved.